Over the weekend, I was just digesting the fourth-round draw for the FA Cup and reflecting on a great weekend of action when the news of Neil Warnock's sacking began to leak through. My mind was jolted back to the woes of the Premier League. 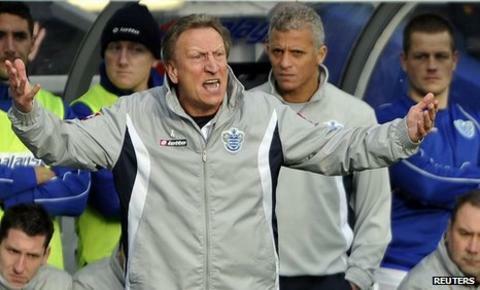 Warnock's sacking is something of surprise. His newly promoted team started with a resounding 4-0 home defeat at the hands of Bolton but they have not been in the relegation zone since. It's also a team largely rebuilt after promotion. The side which got out of the Championship leant far too heavily on the talents of Adel Taarabt, a player who Warnock had clearly decided either lacks the application or the ability to be a top player in the Premier League. So it might seem a bit harsh to sack the guy who got you into the big league before he's had time to really bed a new team together. My guess is that Rangers' owner Tony Fernandes looked at the Christmas and new year programme and saw a trend he did not like. This year the Premier League clubs played five times in 19 days over that holiday period. That's more than an eighth of the season played out in not much more than a fortnight. With January such a key time for transfers, the importance of those five results is highlighted even further. Any doubts an owner might have about a manager will not be allowed to linger when that manager is about to spend some of your hard-earned cash in the sales. I passed the time on a tediously long and much-delayed train journey from Liverpool to London last week sorting out the Christmas stars from the donkeys. It's not rocket-science but here is a mini-table based on those key results showing the trends which twitchy fingered chairman are examining. Neil Warnock, look away now. Dropping five points in five games might not have been brilliant by Manchester City's standards this season but it was good enough to keep their lead at the top of the Premier League. Tottenham's results add weight to Sir Alex Ferguson's view that they are playing the best football of anyone just now, while Sunderland obviously had a fantastic spell and, as we know, QPR had a shocker. Everton and Fulham can be pretty satisfied with how they did overall despite a bad result each. Stoke and Aston Villa were below par and, though Bolton are struggling, they still made ground on all their relegation rivals. Newcastle's win over Manchester United salvaged a tricky patch for them; Arsenal were back to being hit and miss, while Chelsea's lowly position would have been even worse but for that last-minute winner at Wolves. So here's to the second half of the season; January transfer shocks, managerial sackings, crazy results and brilliant goals. Hopefully faster trains too!